Why a war on poor people? American conservatives for the past several decades have shown a remarkable hostility to poor people in our country. The recent effort to slash the SNAP food stamp program in the House (link); the astounding refusal of 26 Republican governors to expand Medicaid coverage in their states — depriving millions of poor people from access to Medicaid health coverage (link); and the general legislative indifference to a rising poverty rate in the United States — all this suggests something beyond ideology or neglect. Most shameful, many would feel, is the attempt to reduce food assistance in a time of rising poverty and deprivation. It’s hard to see how a government or party could justify taking food assistance away from hungry adults and children, especially in a time of rising poverty. And yet this is precisely the effort we have witnessed in the past several months in revisions to the farm bill in the House of Representatives. In a recent post Dave Johnson debunks the myths and falsehoods underlying conservative attacks on the food stamp program in the House revision of the farm bill (link). This tenor of our politics indicates an overt hostility and animus towards poor people. How is it possible to explain this part of contemporary politics on the right? What can account for this persistent and unblinking hostility towards poor people? Another element here seems to have something to do with social distance. 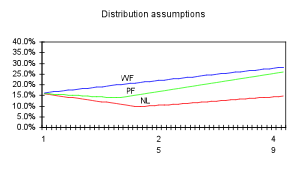 Segments of society with whom one has not contact may be easier to treat impersonally and cruelly. How many conservative legislators or governors have actually spent time with poor people, with the working poor, and with poor children? But without exposure to one’s fellow citizens in many different life circumstances, it is hard to acquire the inner qualities of compassion and caring that make one sensitive to the facts about poverty. A crucial thread here seems to be a familiar American narrative around race. The language of welfare reform, abuse of food stamps, and the inner city is interwoven with racial assumptions and stereotypes. Joan Walsh’s recent column in Salon (link) does a good job of connecting the dots between conservative rhetoric in the past thirty years and racism. She quotes a particularly prophetic passage from Lee Atwater in 1982 that basically lays out the transition from overtly racist language to coded language couched in terms of “big government”. Finally, it seems unavoidable that some of this hostility derives from a fairly straightforward conflict of group interests. In order to create programs and economic opportunities that would significantly reduce poverty, it takes government spending — on income and food support, on education, on housing allowances, and on public amenities for low-income people. Government spending requires taxation; and taxation reduces the income and wealth of households at the top of the ladder. So there is a fairly obvious connection between an anti-poverty legislative agenda and the material interests of the privileged in our economy. These are a few hypotheses about where the animus to the poor comes from. But there is an equally important puzzle about the political passivity of the poor. It is puzzling to consider why the millions of people who are the subject of this hostility do not create a potent electoral block that can force significant changes on our political discourse. Why are poor people in Texas, Florida, and other non-adopting states not voicing their opposition to the governors and legislators who are sacrificing their health to a political ideology in the current struggles over Medicaid expansion? Two factors seem to be relevant in explaining the political powerlessness of the poor. One is the gerrymandering that has reached an exact science in many state legislatures in recent years, with unassailable majorities for the incumbent party. This means that poor people have little chance of defeating conservative candidates in congressional elections. And second are the resurgent efforts that the Supreme Court enabled last summer to create ever-more onerous voting requirements, once again giving every appearance of serving the purpose of limiting voter participation by poor and minority groups. So conservative incumbents feel largely immune from the political interests that they dis-serve. This topic hasn’t gotten the attention it deserves in studies of American politics. One exception is the work of Frances Fox Piven and Richard Cloward. In Poor People’s Movements: Why They Succeed, How They Fail they offer a powerful interpretation of the challenge of bringing poverty into politics. 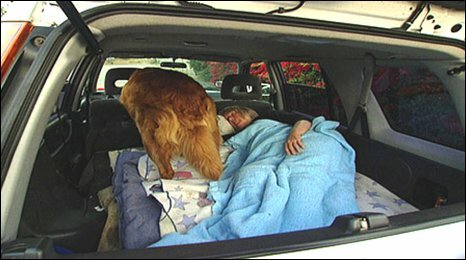 Most poor people are “working poor” and are not homeless. But there are hundreds of thousands of homeless people in the United States, and their living conditions are horrible. Here is a powerful and humanizing album that captures some of the situation of homeless people in America. Give US Your Poor is worth listening to. How important should the subject of poverty be within the discipline of economics? Some economists appear to think it is a very small issue compared to the magnificent mathematics of general equilibrium theory. Others believe that economics should fundamentally be about the sources of human well-being and misery, and that understanding poverty is absolutely fundamental for economics. How should we try to sort this out? Among the contemporary economists who have given the greatest attention to poverty and deprivation, Amartya Sen and Jean Dreze are particularly outstanding. Their research on well-being, quality of life, and hunger set a standard for the point of view that says that life quality and deprivation need to be at the top of the list of economic research goals. Here I’m thinking of books like Inequality Reexamined, Poverty and Famines: An Essay on Entitlement and Deprivation, and Hunger and Public Action. The neoclassical free market purists stand at the other end of the garden. The economists of the Chicago School put primary emphasis on the beneficent effects of untrammeled market behavior, and they give little attention to the “market imperfections” that poverty and deprivation represent. (The word “poverty” does not occur in the index of John Van Overtveldt’s good intellectual history of the Chicago School, The Chicago School: How the University of Chicago Assembled the Thinkers Who Revolutionized Economics and Business.) Poverty seems to be viewed as a normal and fair result of the workings of market institutions: some people make large contributions and earn high income, and others make small or zero contributions and earn low income. The closing chapter of Milton Friedman’s Capitalism and Freedom is entitled “The Alleviation of Poverty.” Here Friedman admits that poverty is a problem, but conceives of only two solutions: private charity (which he agrees will not work in a large complex society) and direct transfers from tax revenues to payments to the poor (which is limited by the willingness of citizens to provide taxes for this purpose). 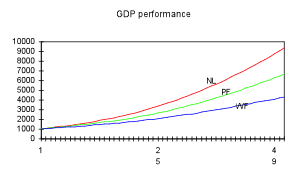 The mechanism he prefers is a negative income tax: persons with incomes below a given threshold would receive payments determined by their income levels. “In this way, it would be possible to set a floor below which no man’s net income (defined now to include the subsidy) could fall” (192). What this analysis leaves out is any consideration of the economic mechanisms that produce poverty within an affluent society, and how institutions could be adjusted so that poverty and inequality tended to fall over time as a consequence of the normal workings of economic institutions. Take race in America, for example — a set of institutions that many observers see as being crucial mechanisms in the production of urban poverty. Writing in 1962, Friedman argues that racial discrimination in employment is essentially impossible within a competitive market system (link). But we now understand the geography and social structuring of poverty much better. Racial segregation in housing has not disappeared; it has only worsened. Low-quality and ineffective schools are concentrated in low-income and racially segregated neighborhoods, so poor people have reduced educational opportunities. Access to jobs is also constrained by geography and educational opportunity. (Here is a recent post on the mechanisms of racial disparities; link). So it seems clear that our economy systematically reproduces poverty in inner cities rather than reducing it. And the situation of rural poverty is not substantially better. So the idea that a properly functioning market economy will tend to reduce poverty and narrow the extremes of income inequality has been historically refuted — at least in the case of American capitalism. It is apparent that the ills of poverty are debilitating to the families who experience it; their quality of life is dramatically lower than it needs to be in an affluent society. So that is one reason for economists to give higher priority to the study of the mechanisms and structures that reproduce poverty in the United States. But there is a more systemic reason as well: if 15% of all Americans live in poverty (46 million people), and if 22% of children live in poor households (16 million children), this implies a huge drain on the productive capacity of the American economy. Education, health, and inclusion are important components of economic growth; and each of these is harmed by the persistence of poverty. So economists ought to be in the lead when it comes to placing a priority on poverty research. This emphasis on study of the concrete institutions embodied in a given economy, and the distributive characteristics that these create, seems like a very good starting point for arriving at a better understanding of the economic foundations of poverty than we currently have. When a society’s governmental and economic institutions are enmeshed in a period of rapid change, many of the components of life quality are likely to be affected — positively or negatively. The basic institutions of a society determine the value of the private and public assets individuals and households control on the basis of which to support their pursuit of a decent life; this is what Amartya Sen refers to as “entitlement bundles”. (Sen applies his entitlement theory to the study of famine in Poverty and Famines: An Essay on Entitlement and Deprivation; link.) And shifts in the composition of the entitlement bundle are likely to lead to abrupt worsening of the conditions of the least-well-off. For example: It is likely that the austerity policies of the Spanish or Greek governments will have a negative effect on the health and nutritional status of the bottom half of those societies. Working people will have lower incomes and they will have reduced access to the social safety net; health status is likely to decline. As another example: Life expectancy in the former Soviet Union declined measurably following the collapse of the Soviet system (link). One part of that decline was the disappearance of the social security net created by state-owned industry — the smashing of the “iron rice bowl”. This concern is particularly relevant in the context of the rural-urban transformation currently underway in China. 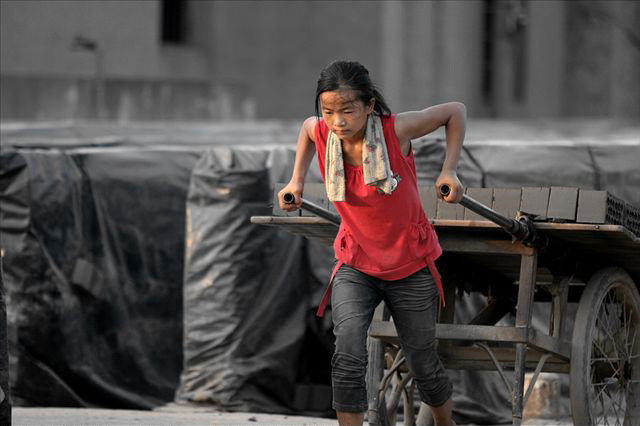 Since 1980 China’s rural sector has been subject to at least two major kinds of structural change. 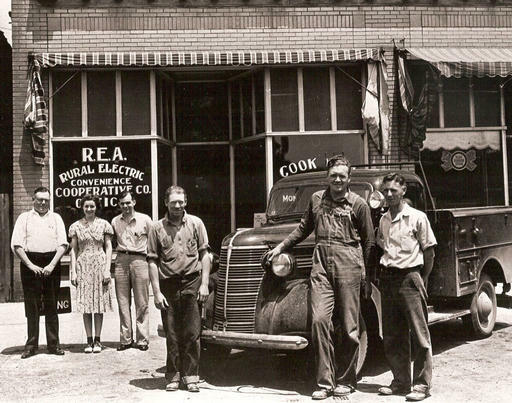 One has to do with the economic and political institutions that governed daily life for rural households, from communes to market institutions. And the other has to do with the rapid structural transformation of China’s economy from agriculture to export-led manufacturing. The first set of changes led to a withdrawal of forms of “social insurance” that had been associated with the commune system, including healthcare and old-age care. The second has led to mass migration of younger workers from villages and towns to factories in cities. This migration leaves the remaining population in the countryside older, poorer, and less economically secure. These observations have several important implications. Foremost among these is the crucial importance of maintaining effective systems for monitoring and measuring life quality across the society. It is important to have good measures of health status, nutritional status, educational status, and old age life quality across regions and sub-populations. So national governments need to create and fund the social research activities necessary to measure health and other quality of life properties across the population. (Here is a recent post on a spatial study of quality of life in China based on 1982 data; link.) Sen argues that it was the availability or lack of availability of information about famine conditions that explained the difference in outcomes between China during the Great Leap Forward and post-independence India; Poverty and Famines: An Essay on Entitlement and Deprivation. Second, when it turns out that there are large numbers of “losers” in a large social process of change, it is important for the state and non-governmental actors to find institutions and resources that will help to improve their outcomes. “Winners” need to help to fund the amelioration of harms created by the processes that led to their gains. If NAFTA led to the increase of overall national income for Canada, Mexico, and the United States, but also led to the displacement of workers in a significant set of industries — then it makes sense to tax part of those gains to compensate the losers. And in fact, the NAFTA agreements were premised on such compensation, though this has not occurred reliably (link). This means redistribution across sectors and regions; and it is justified by the fact that the overall gains created by the transformation would not have been possible without imposing these losses on the disadvantaged sector or region. It might be asked, “Why should developing nations concern themselves with this issue?” There are several answers. Basic justice and fairness entails that the wealth of a society should be distributed in ways that allow all segments of society to improve their quality of life and wellbeing. A society’s wealth and income is a joint product of its entire population; so fairness dictates that everyone should benefit from improvements in productivity. But prudence lines up with this answer as well. A society that ignores the widening of the gaps between rich and poor, and does not concern itself about improving the wellbeing of the poor, is likely to suffer a rising level of social strife as well. It can either go the route of creating gated communities for the rich, or it can use its resources to create fair life outcomes and fair access to opportunity for all its people. Everyone is better off in the long run with the second choice. The neo-liberal strategy consistently maximizes GDP; but the poverty-first strategy, which is more redistributive from the start, leads to consistently better improvement for the income for the bottom 40% of the economy. It embodies the idea that Hollis Chenery advocated forty years ago in Redistribution with Growth: Policies to Improve Income Distribution in Developing Countries in the Context of Economic Growth. If you live within the reach of a major American city — and most Americans do — then you know what “marginality” is. It is the sizable sub-population of metropolitan America of young men and women who have been locked out of what we think of as the indispensable mechanisms of social mobility: decent education, healthcare resources, job opportunities, and safe neighborhoods. It is the young people of inner-city Baltimore depicted by The Wire. (Take a look at Richard Florida’s detailed analysis of the spatial class structure of Detroit and a number of other cities; link.) The facts of compacted poverty and lack of opportunity, and the disaffection of young people that goes along with these absences, represent one of the most pressing social problems we face. How should we go about studying and changing this appalling social reality? Alford Young’s The Minds of Marginalized Black Men: Making Sense of Mobility, Opportunity, and Future Life Chances is one striking approach, using extended interviews to gain insight into the minds, worldviews, and social realities of some of these young people. 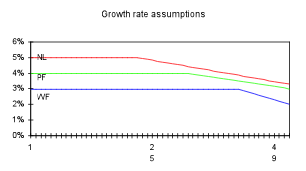 (Here is an earlier discussion of Young’s work; link.) Another approach is the large body of mainstream poverty research in the social sciences and policy studies. (Here is a penetrating critique of some of the assumptions of this research by Alice O’Connor; Poverty Knowledge: Social Science, Social Policy, and the Poor in Twentieth-Century U.S. History.) But an important and original voice on these issues is that of Loïc Wacquant, and particularly important is Urban Outcasts: A Comparative Sociology of Advanced Marginality (2008). 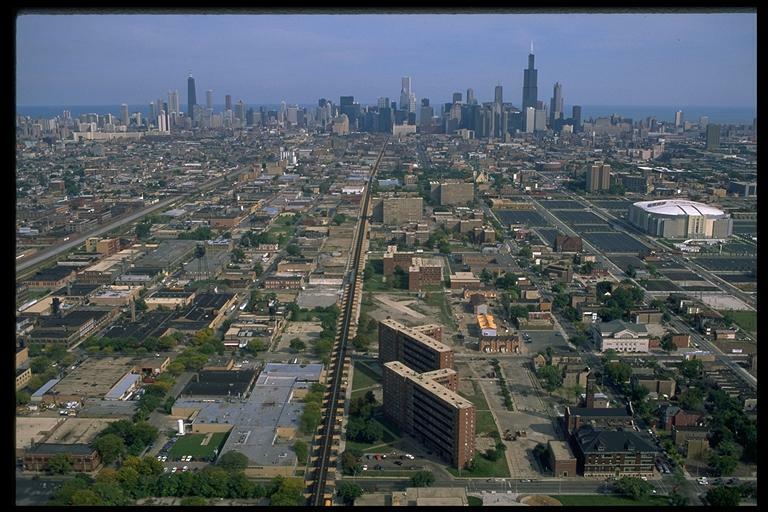 Wacquant’s Ph.D. work was done at the University of Chicago (like Young’s), and he too immersed himself in the street-level realities of segregated, impoverished Chicago. Wacquant’s approach was a novel one: he took up boxing in an inner city boxing club to gain access to the ordinary lives of the young men of the neighborhoods. His ethnography of this experience was published in the fascinating book, Body and Soul: Notebooks of an Apprentice Boxer. An element that Wacquant finds to be in common across advanced marginality in modern cities is what he calls “territorial fixation” — the confinement of the marginal in specific neighborhoods of the city. In Urban Outcasts Wacquant provides a much more developed comparative sociology of marginalized urban populations. 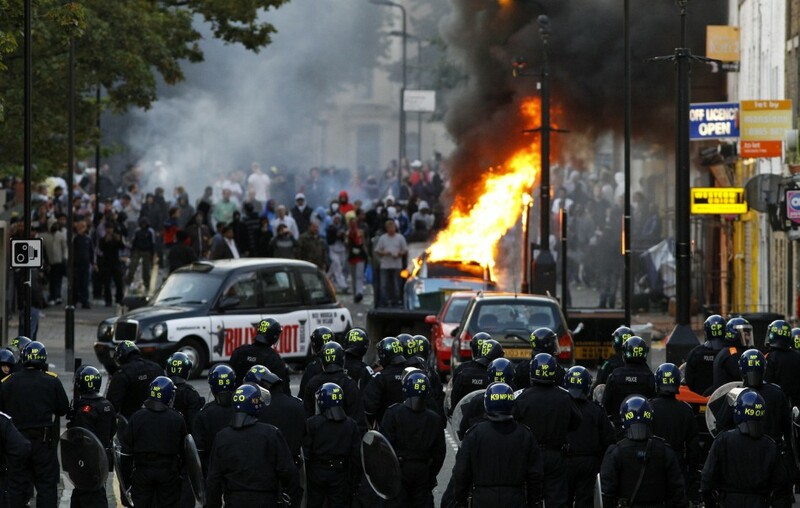 It is significant that he begins his treatment of marginality with the topic of riot and uprising — a recurring social reality in the United States (Chicago, Watts, Detroit, …), London, Strasbourg, and Paris. This seems significant, because it seems like a logical correlate with the deprivation and stigmatization associated with advanced marginality. This is a superb piece of sociology, making use of multiple means of inquiry (ethnographic, comparison, statistical) to arrive at credible theories of the causes of urban marginality. And, contrary to the critique offered by O’Connor of mainstream poverty studies, there is not an ounce of “blaming the poor” in this study. Wacquant wants to understand the social processes that create and reproduce the urban spatial reality of marginality. And in doing this, he aims to provide some of the understanding we will need to begin to take this system apart. One of the important developments in efforts to measure economic progress has been the creation of various measures of quality of life. Average income by itself is not a good indicator of wellbeing; instead we need to have a way of assessing the health, nutrition, and education status of a population over time. The Human Development Index is one such measure, developed by the United Nations Development Programme. (Here is the 2011 report — Human Development Report 2011: Sustainability and Equity: Towards a Better Future for All, and here is a resource describing the methodology associated with the index.) A defect in many such efforts is the fact that they are assessed at the country level, so internal regional variations in quality of life are not observable. Walter H. Aschmoneit provided a truly fascinating effort in 1990 to provide a disaggregated study of quality of life in China circa 1982. 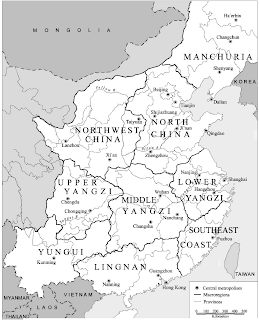 The research is contained in Delman, Ostergaard, and Christansen, Remaking Peasant China: Problems of Rural Development and Institutions at the Start of the 1990’s and the map that he constructs is represented above. 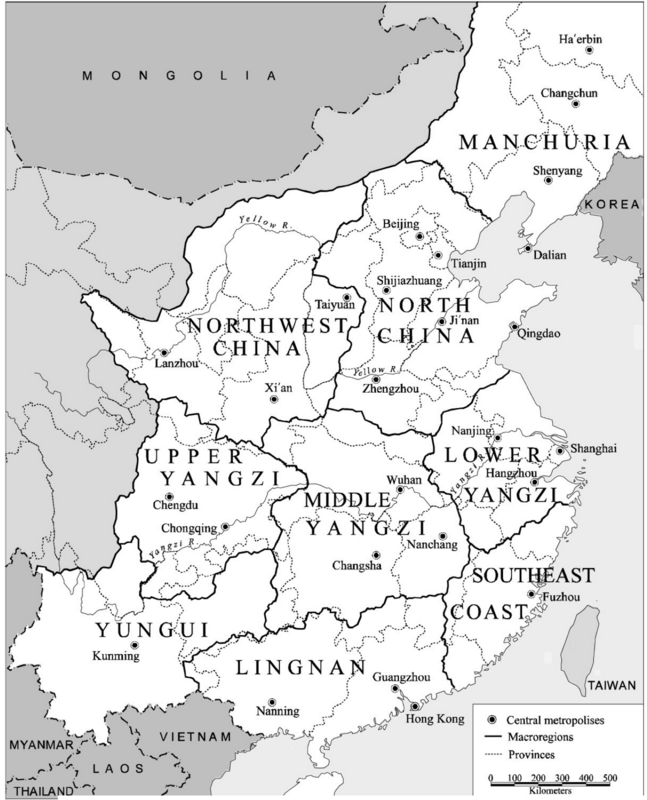 The data Aschmoneit uses to populate this index for the local administrative units (xian and shi) into which the Chinese population was divided derive from the 1987 Population Atlas of China (collected in 1982). There were 2,378 administrative units represented in the study. This means the data reflects the period shortly after the beginning of the reform of agriculture which led to China’s extended period of rapid economic growth. The regions of Lingnan, Southeast Coast, Lower Yangzi, and North China have the highest quality of life, while Upper Yangzi, Northwest China, and Yungui have the lowest. Today it would be possible to present this data in the form of an interactive map, so the reader would be able to click on a specific place and view its data. This would be of interest because the index combines income data with longevity and education data. So the poverty of a region already gives it low quality of life, irrespective of the performance of the human development characteristics. It would be interesting to see whether the most extreme districts with low quality of life are uniformly disadvantaged, or perhaps have a mix of better and worse health or education outcomes. It would be genuinely interesting and important to reproduce this study today to see whether the basic pattern has changed through these decades of intensive economic growth and the acceleration of inequalities in China. If the 2011 Census includes the same data categories this would be a reasonably straightforward effort. One would expect that the quality of life has gone up in the eastern and southern coastal areas. And it is very possible that quality of life has gone down in rural areas in the interior and the west of China as inequalities have increased and state subsidies have decreased for poor rural areas. 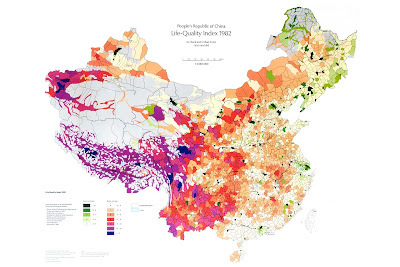 Remaking Peasant China is a book worth owning, not least for the Life-Quality Index map that it provides. The articles are well designed to address some of the key issues that China faced in rural development in the 1980s and 1990s. The book also includes as front paper a map of rural poverty areas at the xian level receiving national support 1986-1990, which gives a visual impression of the distribution of high-poverty areas in the late 1980s. 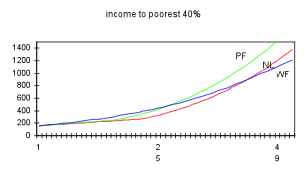 Extreme poverty is defined as regions with more than 40% of rural households with annual per capita income below 150 yuan in 1985. (The map also represents xian with extremely low annual rainfall.) This map was also based on Aschmoneit’s research. This set of questions is particularly important across the lines of division that separate us in modern US society. The question of how poor Appalachian women think about America, or young black inner city men do, or how white suburban teenagers think about their futures, are all deeply interesting questions. And I fully expect that there are interesting and profound differences across and within the mental frameworks of these various groups. A sociologist who breaks new ground on this kind of question is Alford Young, a sociologist at the University of Michigan. His work falls within the field of “cultural sociology”, and he works on issues of race and poverty in urban America. His recent book The Minds of Marginalized Black Men: Making Sense of Mobility, Opportunity, and Future Life Chances is a brilliant effort to get inside the mental frameworks of poor young black men in Chicago. As he points out, most of American society has a pretty simple theory of the consciousness of inner city young men, and it fears what it sees. Violence, drugs, and disaffection are the main correlates. And Young demonstrates that these ideas are wrong in a number of important ways. This is, obviously, a work of qualitative research. It is based on interviews with a relatively small number of individuals. Young’s research hypothesis is that these individuals, while not statistically representative, can shed a great deal of light on the lived experience of young black men in their circumstances and the ways in which these individuals come to think about those circumstances. Young wants to probe the worldviews of these young men; and he also wants to develop some theories about how they acquired these worldviews. What were the factors — structural, cultural, familial — that led to these fairly different bundles of assumptions, frameworks, and beliefs about how society works? And he is particularly interested in probing how these young men conceptualize stratification, inequality, racism, and discrimination. If there is one major surprise in the book, it is the fact that for many of Young’s respondents, these topics are not important and not much thought about. Young argues at length that the mentalities he discovers through these conversations defy stereotypes. He rejects the idea of a “lower-class sub-culture” with a distinctive set of ideas about consumption and favors instead the idea that there are significant and interesting variations within the population of young black urban men. One thing that is particularly interesting that emerges from Young’s analysis is the fact that these men turn out to have fairly different ideas about their own possibilities for mobility and a better life. And Young finds that these differences correspond to the extent of experience the individual has had outside the neighborhood. In addition to the inherent ethnographic importance of better understanding of this segment of our society, Young believes that this kind of inquiry can shed light on important social mechanisms that influence mentality. He singles out social isolation and poverty concentration. This connects to Young’s other recurring theme, the idea of the importance of social capital and social networks for the formation of one’s cognitive frameworks and for the horizon of opportunity that presents itself. The extracts from interviews that Young provides — on home life, school, work, life in the streets, and other topics — are superb, and you feel like you’ve had a rare opportunity yourself to talk with these young men. I think they [white people] look at me as the, not my people, but to the racists, they look at me like the enemy. They feel that we all blacks is out to get them. Which I believe like this here, I’m is out to get them. . . . Yes. . . . Because they getting too much money. We fight for, we fought for the United States, not them. We went to war. We got to stand up for our rights. We not getting treated right. We’re not even getting equal rights. 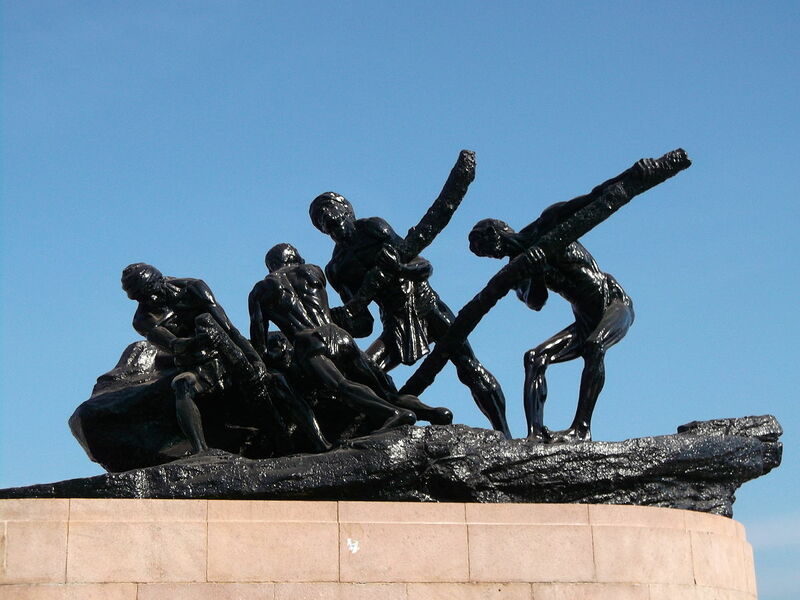 If a better day is to come for poor black men, then researchers and other parties who are sensitive to their plight must commit themselves to a new perspective on these men. In order for their lives to truly improve, increased employment and job-training opportunities need to be brought into their lives. These men certainly would benefit from an expanded and more secure labor market, but, as we have seen, there is much more that must occur for them to improve their lives. As the men’s testimonies about work make clear, however, increased employment opportunities alone will not deliver them from socioeconomic disadvantage. Information about municipal labor market opportunities, including the options and possibilities in the modern urban world of work and the means and mechanisms for accessing better employment, are as important as the jobs themselves. Economic development is of course needed in our cities. But Young makes a crucial point that I would paraphrase in different terms. The extreme residential segregation that most American cities contain is itself a major obstacle to social mobility — not only in terms of economic opportunities, but in the very fabric of how different groups understand the social world around them. Segregation is epistemic as well as economic. Where is poverty on the national agenda? Our elected officials are charged to do their best to create legislation and policies that work best to secure the important life interests of all citizens. Can we take that as a shared assumption? This is how we want it to work, and we feel morally offended when legislators substitute their own wants and opinions for those of the public. If this is a fair description of the role obligations connected to elected office, then there are some important discrepancies that arise when we look at the actual work that legislators do, both nationally and at the state level. For example, a striking number of legislators bring their own personal and religious convictions into their work. Legislators all too often attempt to draft legislation that furthers their moral opinions on issues like stem cell research, gay marriage, abortion, and even birth control. But given that reasonable and morally grounded people disagree about these issues, how could they possibly be the legitimate object of legislation? Legislation needs to be designed to treat all citizens equally and fairly, so how can the personal moral or religious opinions of the legislator ever be a legitimate foundation for legislation? How is it any different from a legislator who tries to steer a highway project over a particular piece of land in order to favor his own business interests? In each case the legislator is substituting a personal interest for the public interest as a foundation for legislation. 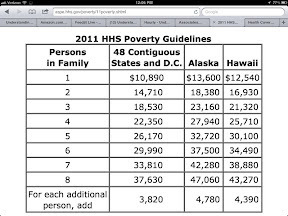 Or how about this puzzle: every state in the country has serious problems of poverty and discrimination. 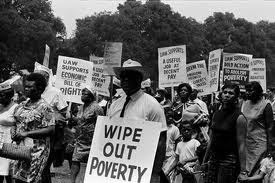 That means that every state has a percentage of its citizens who live under demeaning and impoverishing circumstances. And in many cases this current fact derives from a past history of segregation, discrimination, and unfair treatment. These problems are urgent and pressing. If the responsibility of legislators is to identify and address urgent, pressing problems, they ought to be intensely interested in poverty, discrimination, and racial disparities. So why is it that virtually all governors and state legislators continue to ignore these facts — even when their own departments of human services are fully able to document the human results of these facts about poverty? Why is it virtually impossible for elected officials to address the facts of racial inequality in American cities? Can we imagine a legislature in Illinois, New York, Florida, or Michigan undertaking a serious debate to decide how best to address racial disparities in the state? And yet — doesn’t the fact that legislators are responsible for preserving and enhancing the quality of life of all citizens simply require honesty and action about these facts? There seem to be a couple of reasons why that kind of honest debate does not occur. One is the position of relative privilege from which elected officials are usually drawn. It is possible to lose sight of unpleasant truths about your own society when they don’t really impinge on your own daily life. And it is possible to tell a story of “progress and problem solving” that succeeds in papering over the unpleasant truths. Another possible interpretation is a regrettable hard-heartedness that many people have in the face of poverty. “There is nothing to be done; the poor bring their deprivation upon themselves; the poor are different from the rest of us.” These attitudes are all too common in our politics, and they often get intertwined with a long history of racialized thinking as well. I think there is another possibility as well that has more to do with “problem cognition”. An honest politician may accurately perceive the human cost of persistent poverty, and he/she might also have a sincerely empathetic response to these perceptions. But this politician may be wedded to a particular theory of social change that leads him or her to discount the systemic features of the poverty he sees. For example, the “jobs, jobs, jobs” mantra may push out other more nuanced theories about how poverty and the inequalities of race can be addressed. If you think that the cause of poverty is simply the unemployment rate, then you may feel justified in ignoring race and paying attention to business growth. but this is a mistake. Racial disparities and inter-generational poverty are created by specific, durable institutions, and they can only be attacked on the basis of intelligent and specific strategies. Trickle-down economics doesn’t work for specific segments of America’s population. So getting government and elected officials to place poverty on the action agenda is hard work, and the officials themselves are unlikely to lead the way. This implies — to me anyway — that anti-poverty, anti-racism organizations will need to take the lead. There are such organizations in every city. Are there ways for them to gain more influence? 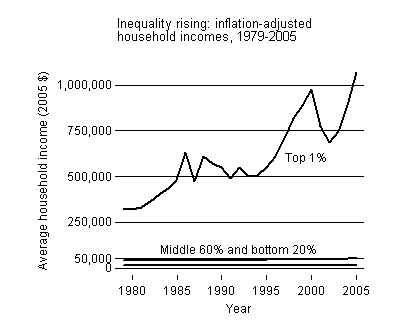 We’ve been focusing on the 1 percent and the 99 percent for the past year, thanks to the Occupy movement. But here’s another way of slicing American society — right down the middle. How is the 50 percent doing these days? The answer seems to be, not very well. And the conservative assault on the social safety net pretty much guarantees that this part of American society will do even worse in the coming years. Poverty is concentrated in this half of America, both adult and child; the percentage of uninsured people is high; and the median income has dropped significantly since 2000. 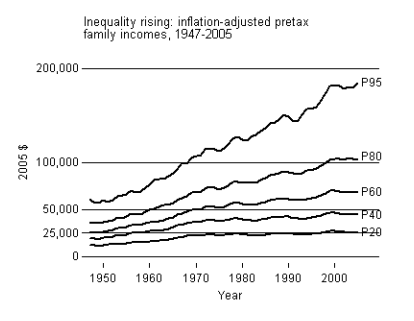 The inequalities that have worsened in the US since 1980 have hurt the bottom half significantly. Median household income fell 2.3% to $49,445 last year and has dropped 7% since 2000 after adjusting for inflation, the Census Bureau said Tuesday. Income was the lowest since 1996. Poverty rose, too. The share of people living in poverty hit 15.1%, the highest level since 1993, and 2.6 million more people moved into poverty, the most since Census began keeping track in 1959. The poverty statistic is stunning: it implies that 30 percent of the bottom 50 percent are officially living in poverty — almost one-third. This shows that 58% of non-elderly Americans with income below 250% of the Federal poverty line are uninsured, while 12% of non-elderly Americans between 250% and 400% of FPL are uninsured. 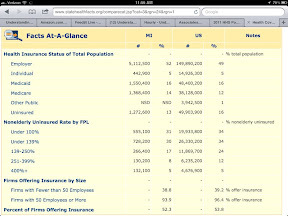 Only 5% of non-elderly Americans with income in excess of 400% of the Federal poverty line are uninsured. A household of 4 persons has a Federal poverty line of $22,350 on this standard, so 250% of this is $55,875 — a bit above the median household income for 2011. So lack of health insurance is heavily concentrated in the bottom 50 percent. What is our society doing about these basic realities? Not very much. And, of course, a major candidate for President is on record: “I’m not concerned about the very poor” (link). One would hope that the bottom 50 percent think very carefully about which political platform best serves their real interests, including maintenance of a social safety net, aggressive and effective efforts to stimulate job growth, tax reform that requires the affluent to pay their fair share, and preservation of the broadened health insurance coverage promised by the 2010 health care reform legislation.